Hiring professional painters for your interior or exterior house painting project is just part of ensuring that your home is painted correctly. The paint quality you choose is equally as important when it comes to a beautiful, long-lasting paint job. Cheap paint, even if applied by an expert painter, won’t do your home any favors. 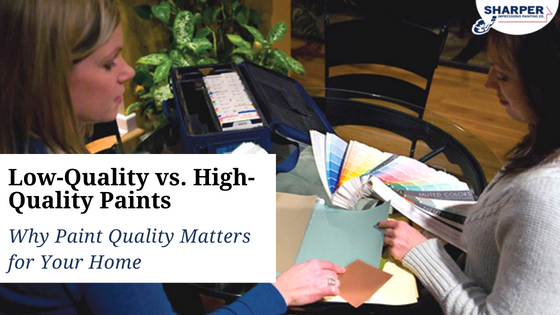 It’s critical to understand the differences between low-quality and high-quality house paints and why paint quality matters. Doing so will help you save money and frustration in the long-term. When you invest in your home, you probably want to jump on some great home renovation deals. But, choosing a bargain paint over one that is more high-quality won’t give you the best deal in the long run. While you may think the price is right, there are hidden costs that come along with those cheap cans of paint. Buying cheap paint means using more of it. While low-quality paint can save you some money at first, you will find that the formula requires more than one or two coats of paint. This means you will need to purchase more cans of paint for your painting project — which isn’t such a good deal after all. Low-quality paint doesn’t last very long. When you decide to skimp on paint quality, you will see the difference after just a few years. Cheap paints simply aren’t as durable and won’t last nearly as long as high-quality paints. Opting for a bargain paint will have you spending more money on a refresh much sooner than you’d like. A high-quality paint consists of ingredients that make for a smoother, easier application that lasts. When you select a high-end paint for your interior painting or exterior painting project, you will reap the following rewards for many years. A long-lasting paint job. If you don’t want to repaint your walls every year due to fading, cracking and peeling, then high-quality paint is your best option. This is especially true if you need to paint high-traffic interior areas such as entryways, kitchens and bathrooms, or your home exterior. Using a quality paint will ensure interior and exterior walls and trim look great for longer as the formula is made to hold up against regular wear and in all types of environmental conditions. You won’t need as many coats. High-quality paints offer more pigmentation than low-quality paints. The better the pigments, the smaller and purer they are. This is important as good pigmentation offers more coverage, color and depth to your paint job. These pigments help the paint easily hide what you’re painting over; whether it’s an old color or imperfections. Cheap paints have larger pigments that only work to increase the amount of paint in the can as opposed to enhancing color and coverage. This is just one reason why low-quality paint requires more coats than high-quality paint. Because binders are the most expensive ingredient in any type of paint, you will only find low-quality binders in cheaper paints. They can protect your home. High-quality paints not only provide beautiful, even color, but also mildew and spoilage protection. Paints that are lower in quality do not contain these added benefits which can result in an inferior paint job. Cheap builder paint sometimes last just one year while high-quality repaints can protect your home for well over 15 years. Paint quality matters when it comes to painting your home. Our team of professional house painters understands the value of high-quality paints and only uses trusted paint brands like PPG Paints and Sherwin Williams. We have over 25 years of experience working in our industry and will help you pick the perfect paint for your interior or exterior painting project. Ask about our free in-home paint color consultations, or get your free house painting quote today!